Telangana Police Constable Recruitment 2017, TSLPRB Constable Recruitment 2017,TSLPRB to fill 3897 Police Constable(PC) Posts 2017 in Telangana: DGP Telangana, TSLPRB to fill the 3897 Police Constable Posts 2017 in Telangana. TSLPRB will give Police Constable Posts 2017 Recruitment notification and Online Applications would be invited through On-line mode only in the prescribed proforma to be made available on #TSLPRB webportal (www.tslprb.in ). 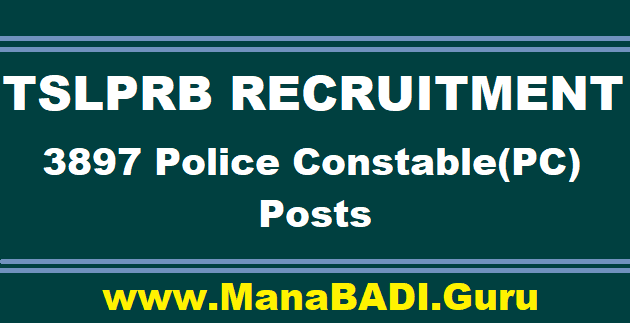 TSLPRB Police Constable Posts 2017 Syllabus, Online Application Form, Eligibility Criteria, Qualifications, Registration Fee, How to Apply, Last date, Hall Tickets, Results/Selection List, Exam Pattern, Exam Date details are to be available on TSLPRB Web portal. Telangana Police Constable Recruitment 2017, TSLPRB Constable Recruitment 2017 has bee just now out and aspiring candidates can apply before last date. Telangana is a newly formed state and has plenty of employment opportunities in Police Department. The Government of Telangana, Telangana State Level Police Recruitment Board (TSLPRB) is going to release a new notification for filling up 3897 Constable, Other vacancies. Every year, before formation of Telangana State, Ap Government is to issued the notification for the recruitment of various posts. But now its time for the Telangana Government to issued the Telangana Police Recruitment for filling up the vacancies like Constable in AR, Civil departments in regions that includes Hyderabad, Cyberabad, Warangal. In this post we have provided you with details like Syllabus for Telangana Police Constable recruitment, Telangana Police Constable Admit Cards, Telangana Police Constable Recruitment Notification release dates, Important dates, last date to apply online, etc. G.O.Ms.No. 156 Dated: 30-10-2017 :: GOVERNMENT OF TELANGANA - FINANCE (HRM-VII) DEPARTMENT - Public Services - Home Department - Recruitment - Filling of (3897) Three Thousand Eight Hundred and Ninety Seven vacant posts in various categories under the control of Director General of Police, Telangana, Hyderabad, by Direct Recruitment through Telangana State Level Police Recruitment Board, Hyderabad – Orders – Issued. Read the following:- Ref: Home (Genl) Dept., U.O.No.2680(P)/Genl/A2/2017, dt:11.10.2017. 2. The Telangana State Level Police Recruitment Board, Hyderabad shall take appropriate steps for filling the above vacancies through direct recruitment by obtaining the details, such as local cadre wise / vacancy position, roster points and qualifications etc., from the concerned authorities. The Telangana State Level Police Recruitment Board Hyderabad shall issue the notification and schedule for recruitment expeditiously. 3. The administrative department and the Head of Department concerned shall furnish details of all vacant posts authorized in this order, including the local cadre wise / roster points and qualifications, etc., to the recruiting agency immediately under intimation to Finance Department. The Department shall issue necessary amendments to their service rules / Bye-laws / Government Orders changing the existing recruitment procedure /recruiting agency wherever necessary. Aspirants who are eligible and interested for this Telangana Police Constable Recruitment 2017 should have completed their 10th class, 12th class or its equivalent. Applying job aspirants should have age above 18 years and below 33 years for Fireman posts, 25 years for all other posts. To apply for this recruitment, applicants have to pay Rs. 400/- ( in case of OC/BC) and Rs. 200/- (in case of SC/ST) as specified in the notification. Complete information regarding this TS Police Recruitment 2017 like age limit, pay scale details, TS Police Selection process, application fee, required qualifications, TS Police online application process, last date to apply, TS Police exam syllabus, exam pattern, etc., are included in this post. Candidates should acquire 10th class or 12th class or Graduation or its equivalent qualification from recognized Board or University or Institute. Should have age between 18 to 25 years (for post no. 1 to 5) and 18 to 33 years (for post no. 6) as on 1st July 2015. Age relaxations for reserved category candidates will be applicable as per govt norms.rules. Pay Scale: As per the organization norms. Contenders should pay application fee through any Mee Seva (e-Seva) or TS Online centers. Applicants must obtain a payment receipt after paying the application form which will be used later at time of online application. #Click the link to “Apply Online” available on the home page of the website. #Fill the online application form and upload required scanned copies of documents. #Also pay the required application fee. #At last take a printout copy of your application for future use.